If we're connected on social media, you know I love to share and celebrate all things play! There are plenty of stellar play advocates to connect with, like @Kaboom and @Playworks. Not only will you learn more, you can help spread awareness, discover new playful ideas, and have fun! There are infinite resources on play-based learning and outdoor adventure bouncing around the social sphere. Jump in! Toys have a way of conquering entire rooms, untouched and forgotten. Rather than tossing these lonely items, why not donate them to local charities for another child's enjoyment? Another way to spark playful joy worldwide is to pledge your child's birthday to a organization like Kaboom! In lieu of gifts from family and friends, you can set up a fundraising campaign that "plays it forward". With these donations, Kaboom! Works hard to build playgrounds, create colorful murals, construct theater stages, deliver books, and more. It's a wonderful way to spread happiness and health. In some schools, recess is dwindling. Kids are no longer getting enough time to unwind, explore, and make connections. If you want to become an expert and help reverse this trend, consider joining or hosting a Playworks training program. These events focus on creating ideal recess environments at your local school. I know my girls love recess and the chance it offers to run, imagine, and interact with friends. 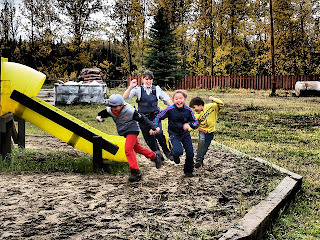 Help you child's school maximize recess, too! My family makes time to play each day, and neighbors often stop by to join us. While impromptu play is wonderful, organized get-togethers also offer endless benefits. As a family, you can organize group hikes, board game nights, playground visits, sporting events, picnics, and more. Schedule weekly or monthly play dates, hang invitations at local grocery stores, businesses, and restaurants, and invite the neighborhood. By including others, you share the power of play and encourage your friends and neighbors to be active and engaged. Everyone wins! No matter how hectic and exhausting life gets, play and laughter can ease stress and help smooth the messy details. Sign up for the YMCA's after-school program, play a game of tag in your backyard after dinner, or go for a bike ride around the neighborhood on a Saturday morning. The fresh air, sunshine, and exercise are all key elements to a happy, healthy lifestyle that nips stress at the bud. This is true for both kids and adults! Play time isn't just for kids. We all need time to unwind, relax, and play! Find a way today to celebrate the power of play and enjoy family time. Whether you try one of my ideas or use your own, there's no better time than now to play!